Be the first to share your favorite memory, photo or story of Loretta. This memorial page is dedicated for family, friends and future generations to celebrate the life of their loved one. 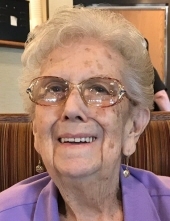 Loretta June Sieracki, age 85 of Macomb, passed away April 2, 2019. She married the love of her life John April 18, 1953. She worked in retail for over 20 years and ended up retiring from Kmart. She enjoyed knitting and shopping in her spare time. Her favorite thing was spending time and getting lunch with her family, especially her grandchildren. Her family was her life. Loving wife of the late John; beloved mother of Michael, Susan (Michael) Dagostino, Lawrence (Yinru), Andrew (Marybeth), Kenneth (Diane), and Donald (the late Gina); cherished grandmother of 12 and great-grandmother of 7; she is also survived by many special nieces and nephews, especially Diana Croce. Predeceased by her siblings Lorraine, Lois, and John. Visitation Friday, April 5 from 3-9pm with a 7pm rosary. Funeral service Saturday, April 6 at St. Isidore Catholic Church at 12pm, instate 11:30am. Prayers at Resurrection Cemetery to follow. To send flowers or a remembrance gift to the family of Loretta June Sieracki, please visit our Tribute Store. 11:30 AM instate or gathering time. We will be meeting at the gates of the cemetery and processing over to the graveside where committal prayers will take place. "Email Address" would like to share the life celebration of Loretta June Sieracki. Click on the "link" to go to share a favorite memory or leave a condolence message for the family.